Around the same time that Soviet scientists were perfecting more and more powerful nuclear weapons, a lowly sergeant was helping to create a much smaller device of war not too far away. Mikhail Kalashnikov probably didn’t realise it, but “The Gun” that would bear his name would end up killing far more people than Soviet nukes. C.J. Chivers tells the story of the AK-47, with the backdrop of a general history of automatic weaponry. Swinging back to the days of the American Civil War, when one Richard J. Gatling tried to introduce a new automated form of gunfire to the battlefield, Chivers takes the history of automatic weapons step by step, and in so doing adds a great deal of depth and understanding to the overall subject. It would be easy to write a simple book on the AK-47’s design history, its production statistics, its combat record and its enduring legacy, but Chivers does far more than that. 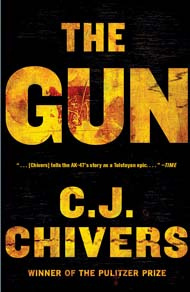 The Gun is a book about one particular weapon on the face of it, but it in truth, you cannot understand the power, the effect and the infamy of the AK-47 without understanding people like Gatling or Hiram Maxim, without understanding the nature of the Cold War, without understanding the geopolitics and living conditions of Africa. Chivers offers that, in an account that merges two very different and competing aspects: historical writing of the highest bent, and the emotionality of modern journalism. It might not be to some tastes, the way that Chivers mixes cold hard history with the more sentimental and vivid narrative surrounding ambushes and the AK-47’s tangible effects on peoples lives, but I found that both parts of this dual project enhanced the other. It is important to understand how the AK-47 was constructed, just as much as it is important to read the recollections of those who have been hit by the same weapon – and lived to tell the tale. It is a very well written and easily read book, albeit very lengthy and detailed. This is no easy stroll through the pages of history, from both its factual depth and the grim accounts of how the main focus has been used. Chivers’ account is marked by two characters, whose lives and demeanour is extremely contrasting. Gatling got the ball rolling on automatic weaponry, but it was Hiram Maxim that really understood the nature of this new weapon and what he was trying to sell. Because that is what the early history of automatic weaponry is, a history of merchandising, of selling a product the same way that others sold health tonics. A man who could be charitably described as “eccentric”, Maxim was every bit the conniving, money obsessed industrialist, who witnessed the carnage his weapon could cause and delighted in it. If not quite amoral, Maxim was certainly uncaring. Chivers brings this unhinged inventor and entrepreneur to life, and in doing so helps bring a level of comprehension to the mindset that so many had towards war and war machinery in the pre World War One days, and how this attitude contributed immensely to the blood soaked affairs on the Somme and at Verdun. The other major character is Kalashnikov himself, who seemed destined for a life of simply being another cog in the vast Soviet machine. Then came the AK-47, lasting fame and unending notoriety. Kalashnikov has had to live with being turned into a major Soviet propaganda symbol, the simple Russian nobody who formed the weapon that was, perhaps his country’s most famous export. He found promotion, has his face plastered on everything up to and including vodka brands. But, from the interviews that Chivers recalls, he is curiously unsatisfied with his lot, forever associated with a device that has, presumably, killed millions of people. Kalashnikov, in The Gun, projects an air of a man who does not care of any of that, insistent that he was simply the man who happened to make it happen, and that it would have been someone else if not him. Nothing particularly untrue about any of that I suppose. But behind it all is that dissatisfaction, a sense that his legacy will be an unwelcome one, which fell out of his control long ago, if he ever had it all. The story of Kalashnikov, the repression his family suffered, his own fear of the gulag, and the way he was used by Moscow all form an indelible picture of the Soviet Union and life there, its griminess and false facade. Then there are the once off case studies of specific events or weapons, the best of which is the chapter dedicated to the American counter-move against the AK-47: the M-16. Chivers gives a searing account, with in-depth first hand sources, of the M-16’s tragic failure in the hands of the US Marine Corps in Vietnam. If the AK-47 was a story of industrial triumph within a military bureaucracy, the early days of the M-16 is the complete opposite: a laxly organised effort that resulted in terrible oversight and a substandard end product, costing lives when things got tough. The image of dead Marines found with a cleaning rod down the barrel of their M-16, trying desperately in their last moments to fix an all too common jam, is a potent one, as is the testing that one enterprising young officer did with his company, firing the rifles to see how many jammed, cleaning them to a tee and then doing it again, only to find the results the same or worse. While the weapon has since been improved immensely, the disaster that was its Vietnam service is as interesting a story as the success of the AK-47. And those successes are manifold. The AK-47 is light, durable, has a simple parts make-up and is incredibly easy to fire, reload and fire again. It has been used of regular armies, guerrilla bands, urban insurgents and child soldiers. It may be inaccurate, but it’s the cheapest way in so many places to get an automatic weapon that won’t jam or fall apart, though Chivers does destroy some misassumptions about the actual modern costs of these weapons, which is more than you might think. The AK-47’s service history is traced through that of the Soviet military, its use by both sides in the Hungarian Uprising, its effectiveness for the North Vietnamese in the Tet offensive, the way it swarmed into regions like Africa, and how children and insurgents still use it today, the markets flooded with examples and derivatives of the original design, with little hope of curtailing them until the inexorable march of time makes them all unusable through sheer attrition – perhaps the most subtly horrifying aspect of the AK-47, which can simply keep going and going and going. The Gun is, perhaps, at its most evocative, an attack on the myth surrounding the weapon. This is one of an unlettered Soviet peasant, through the workers’ paradise of the Soviet Union, making something that is ingenious in its design and wonderful in its function: the defence of the motherland. The AK-47 has long since gone past such a romantic origin that is as full of lies as the minds of LRA child soldiers are full of hate, a hate they exercise through brutality often engendered by this, the most famous of assault rifles. The Gun is the story of how assault rifles have altered the damage potential of “small wars” in many ways, and the final chapters are an extension of that idea, where small guerrilla bands that would been a minor problem a century ago now have the capability to slaughter on a scale that not even the Soviet leadership could have envisioned. But what did The Gun teach me about war? It taught about the bureaucracy and development of weapons: how to do it right, how it can be done wrong, and how sometimes the most insignificant projects can turn into behemoths with a powerful effect on world history. It taught me about the slow process of application within war, of how tactics shift with the coming of new technology, how that technology is found and sold, and the way that our militaries react to what it can do. It taught me about the nature of military technology and the consistent way that humanity, through its political and military leaders, has struggled to keep up. Over a century ago, you could find news articles predicting the irrelevance of machine guns, and military officers still urging for the mass unit charge. Colonial conflicts, the origin of the famous Maxim rhyme you are probably familiar with, didn’t change that despite the overwhelming evidence. The slaughter faced by both sides in the Russo-Japanese war at the hands of machine guns, perhaps the first real industrial war, didn’t change that. It took the years of bloodshed in Europe between 1914 and 1918 to finally change that. But still the lessons take time to embed. The next innovation, submachine guns and then assault rifles, are only slowly developed, and counter-moves like the M16 are botched in their early production. The proliferation of AK-47’s took place amid a complete lack of care from so many parties as to the damage they could inflict. If The Gun has taught me nothing else, it is that we can never underestimate humanity’s capacity to ignore serious problems until it is too late. Lastly, The Gun simply taught me about guns, in a way that so many other military history books have failed to do. So many other narratives treat the actual weapons as some secondary concern, the tool used by the people, who are the actually interesting part. They miss the fact that guns are what make war what it is today, and their history, use and functions can envision stories of efficiency, greed, patriotism and corruption, as much as any other aspect of conflict. This entry was posted in Books, NFB Reading List, Reviews, War and tagged ak-47, books, chivers, history, kalashnikov, reading list, reviews, the gun, war. Bookmark the permalink.